Brady and the Patriots Teach the Bills: The Sounds of Silence | NFL News, as it happens, when it happens. Your one stop shop. As the New England Patriots headed towards their showdown with Rex Ryan and the Buffalo Bills last Sunday many in Buffalo felt their time had come for success. In the early 90’s the Buffalo Bills headed to four straight Super Bowls with quarterback Jim Kelly under center and four straight times they came out with the losers share of the purse. The drama and storylines leading up to last Sunday’s match up had an aggressive and motivated Buffalo juggernaut ready and willing to treat the Super Bowl champions much the same as the Bills had treated AFC finalists, the Indianapolis Colts. Fans filed into Orchard Park ready to cheer on the new and improved Buffalo Bills. Rex had been fanning the flames all week and the Buffalo faithful were engulfed in the inferno. Coach Ryan, not new to feeding into his own bluster, even contacted the Guinness Book of World Records in anticipation for breaking the stadium sound record currently held by the Kansas City Chiefs. The Buffalo fans known collectively as the “Bills Mafia” waited with baited breath for the opening kickoff, the Bills to their credit did not disappoint…. initially. Led by Lesean McCoy’s feet, the Bills made a statement blowing through New England’s defense in 7 plays and scoring a touchdown in their opening drive. The crowd in Orchard Park we’re ecstatic and as Brady and the New England offense took the field they allowed them no reprieve forcing New England to take a time out as the noise level was too overbearing. After a fairly quick three and out by the Patriots both the fans and the Bills themselves were overcome with joy and jubulation. All the speculation, all the heavy talk from Ryan and the Buffalo Bills was bringing victory to their doorstep. Sadly for Buffalo, football games are rarely won on the opening drive. The New England Patriots spent the rest of the game doing whatever they could to not only quiet the masses but send a very distinct message to Rex Ryan,the Buffalo Bills and possibly the entire league. That message was Brady throwing on the vaunted Buffalo defense 59 times for a total of 466 yards and three touchdowns. Bill Belichick’s offense attempted more 4th down conversions than they ever should have allowing Buffalo to get back into the game by the fourth quarter. New England’s willingness to attempt 4th down plays aside, the game was never as close as the final score of 40 – 32 indicated. Rex Ryan and the Buffalo Bills lost to New England due to superior coaching and an offense looking to make a point. New England’s point is that they do their talking on the field. Rex’s team spent the week leading up to Sunday’s game flapping their gums and wearing their emotions on their sleeves. Emotions can be a positive in the game of football but these particular emotions left unfiltered earned the Buffalo Bills a grand total of 14 penalties. Amongst accusations that the “Bills Mafia” have brought whistles to the game in order to distract the Patriots when on the field, it looks as though the Bills themselves may have been doing something their opponents are often accused of: cheating. The Buffalo Bills often use a loud train horn because, well they are the Bills and when you think Buffalo you naturally think trains. Regardless of why Buffalo uses this very loud horn they may have done so illegally during multiple moments when New England was engaged in there hurry up offense. All game tapes are turned in by Wednesday so that matter and the Bills’ consequent punishment, if found guilty, will be dealt with then. It’s interesting to point out that the loud horn was just one more noisy situation to affect Buffalo adversely. 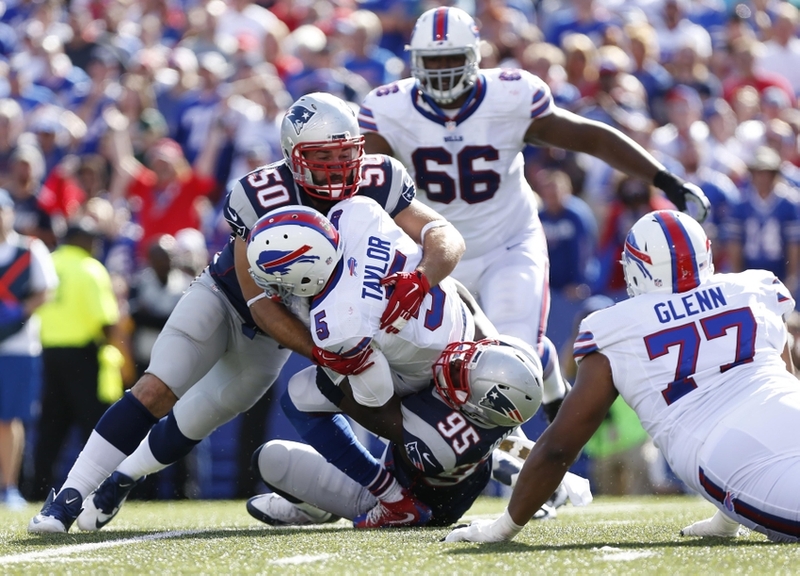 Ultimately, the Bills lost a lot of their swagger and eventually the game on Sunday. Is this the continuation of the Tom Brady Revenge tour or have the Bills finally learned what the Jets have known for years: Rex Ryan just needs to keep his mouth shut and coach some damn football.